Fall is in the air and what better time to start thinking of pumpkins and other fall decorations. I created a fabulous mixed media pumpkin using three different DecoArt Stencils along with lots of crackle to make this quick and easy project. 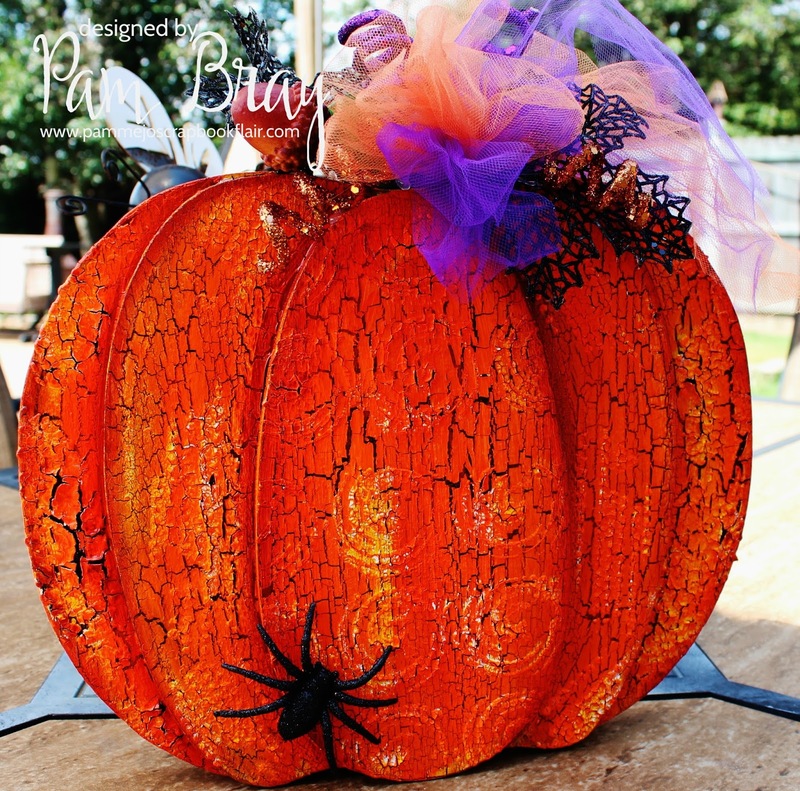 Begin by giving the pumpkins a good coat of Black Carbon paint, allowing it to dry completely. Apply a generous coating of Weathered Wood over the top of prepared pumpkin, dry completely. Apply Crackle Paint with paintbrush allowing it to do its magic as it dries. 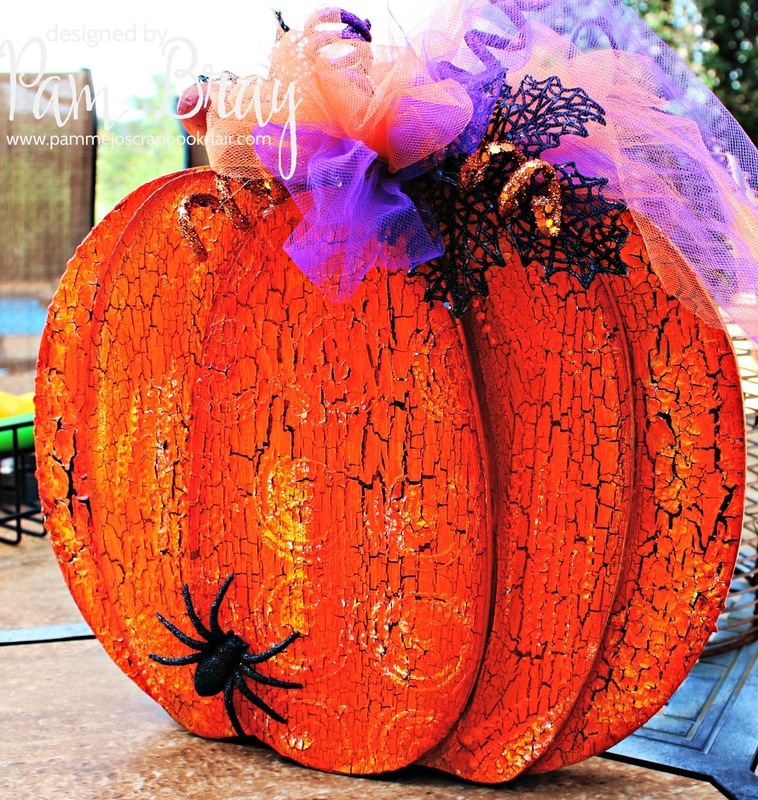 Lay the Whirlpool Stencil on the top pumpkin, apply Crackle Paint with palette knife to top. Dry. Place the Shedded Stencil on second pumpkin; repeat with Crackle Paint and palette knife. Dry. Repeat one last time with the Pixelated Stencil on the last pumpkin using Crackle Paint and pallette knife. Dry. Paint prepared pumpkin with Dairylide Yellow, dry. Repeat with Pyrrole Orange. Dry. Paint stem with Yellow Green Light, dry. Shade leaf with Phithalo Green Yellow and the pumpkin with English Red Oxide, dry. Decorate top with tulle ribbon and floral picks. Add small spider to bottom of prepared pumpkin. Reaching out to touch your juicy pumpkin Pam.... ahhhhh - feel that lumpy, bumpy, glorious chumpy texture... YUMMY. Hehehehhe!!! This is just so FUN. Love the bright ORANGE color - my fav!! It is just PERFECTLY FABULOUS. Xj. this is a fantastic pumpkin. This is awesome! I will have to go over the instructions again to see what I can come up with. Love your beautiful pumpkin. thanks for sharing your "how tos".